The Beerhunter: Would You Like Squid With That? The Beerhunter: Would You Like Squid With That? The Beerhunter: Would You Like Squid With That? Home » Articles » The Beerhunter: Would You Like Squid With That? 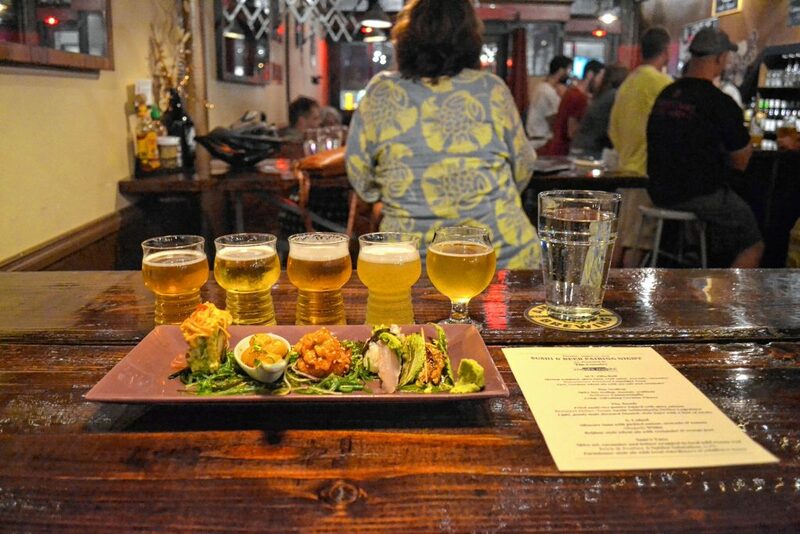 Sour craft beers paired with sushi at a pairing at The Foundry in Northampton in August. If you weren’t expecting this craft beer column to start with a plate of silkworm larvae, believe me, I’m as surprised as you are. But there they were, next to my glass: half a dozen off-white baby bugs, each about an inch long and doused with a honey balsamic sauce. I had no idea how this snack would go down (answer: soft and crispy) or whether the larvae would pair well with my short pour of Madrugada Oscura, a Belgian-style sour stout aged in oak barrels by the Michigan-based Jolly Pumpkin Artisan Ales (turns out they did, thanks to that sauce). All I really knew going into the third annual Sour Soirée — a celebration of sour beers held by The Foundry craft beer bar in Northampton during the last week of October — was that Sonny Han, who co-owns the business with Sally Noble, has been itching to build on traditional notions of what a beer pairing can offer. The menu placed national and international beers alongside foods less commonly found on Valley dinner plates. 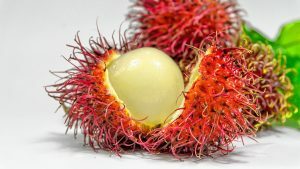 Han paired rambutan, a Southeast Asian fruit similar to the lychee, with a light and lovely strawberry sour saison called Samantha, brewed by Earth Eagle in Portsmouth, NH. He paired smoked mussels with Ghost in the Forest, a sour aged blonde ale by California’s Lost Abbey Brewing. Spicy fermented squid paired with a sour Flanders red ale called Cuvée de Jacobins Rouge, made by the Belgian Brouwerji Omer Vander Ghinste. A lemon persimmon tartlet paired with a golden sour made with lime, grapefruit, ginger, and black pepper by the brewery TRVE in Denver. Then, of course, there were those silkworm larvae. Thank goodness that sour stout was so rich. The Foundry began wading into these waters over the summer, when Han teamed up with Moshimoshi, the Japanese restaurant around the corner, for a one-off sushi and beer pairing night on August 22. That event allowed Han to test-drive his idea for an ongoing series of exotic food pairings. Instead, Han had to create pairings for specially-created samples. Given a roll of shrimp tempura, spicy tuna, crab salad, avocado, and cucumber, he tracked down a Leipziger Gose — a tart German wheat ale with sea salt, coriander, and enough tartness to temper the fattiness of the sushi. To pair with a spicy bay scallop topped with fish eggs and scallions, Han chose a German Pilsner called Rothaus Tannenzäpfle. For fried sushi rice patties topped with spicy salmon: a Munich-style smoked lager from Brauerei Heller-Trum called Aecht Schlenkerla. For a serving of albacore tuna with pickled onions, avocado, and tomato: a sample of Allagash White from Portland, ME. For a bite of spicy eel, cucumber, and lettuce wrapped in wild sesame leaf: a farmhouse-style ale from Brick & Feather in Turners Falls called A Spider Salutation, which is brewed with local elderflowers and wildflower honey. It was important to Han that the five sushi pairings that night — which cost $35 per customer — didn’t pile flavor on top of flavor. This required him to think like a chef about the beers he brought to the pairing table. Hence the Rothaus Pilsner, which provided a palate cleanser after two spicy sushi pieces. The rice patties were hearty and fried, which seemed to call for a light roastiness or smokiness (hence the helles lagerbier). The zesty orange profile of a witbier like Allagash White balances the acidity of pickled onions and the fattiness of avocado. And Brick & Feather’s light-bodied saison has the herbal characteristics to complement the wild sesame leaf filled with eel. Han plans to host more pairings in 2018, which seem likely to provide beer enthusiasts with even more off-the-wall flavors. But in the meantime, The Foundry hosts its fourth annual Bière Noir chocolate pairing this month — an event that pairs six dark beers with six hand-made chocolates by Heavenly Chocolate in Northampton. The event will be held November 13 to 18. As with most pairings at The Foundry, guests can simply walk in and order the pairing while supplies last — no tickets or reservations required.